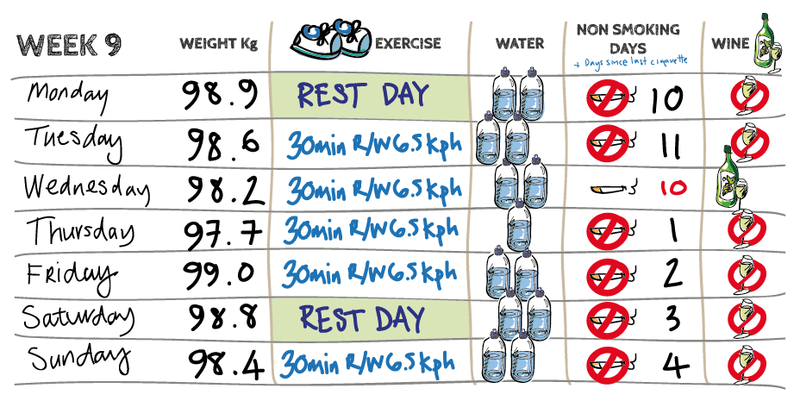 One of the proven ways to help lose weight is the practice of keeping a food diary. I have done this in the past and have found it to be successful via Weight Watchers… BUT have found that it makes me obsess even more about food which drives me nuts. This time round I have decided to weigh in everyday – read it in an old book by Arthur Lydiard back in the days when common sense was everywhere. I figure the scales don’t lie no matter how much I wish they would, and the point is to look at the weekly trend not the day to day fluctuations. An added benefit is that it’s over and done with at the start of the day. My theory is that because it is daily I’ll find myself thinking a bit more about what I shovel in my mouth without having to record every last thing! Of course if this is a complete disaster I may have to resort to the tried and true. Be interested to hear your thoughts on the food diary thing and if you have any tips on how you keep tabs without feeling food obsessed. This is one of my go to dinners when I can’t be bothered with cooking but want something healthy and quick. I usually cook the sauce ahead of time making a double batch to freeze it in cup lots – one cup of sauce is enough for 2 people. Using a steamer pot, add the onion, garlic, oil, chicken stock and pepper to the bottom pot, add enough water to cover and to ensure the pot does not boil dry when steaming the spinach. Place the spinach in the top steamer pot and turn the heat on to high. Check on the spinach from time to time – turn it over to speed cooking time. Keep and eye on the water to make sure it does not boil dry. The onions should be cooked and the spinach soft within 10-15 min. Allow to cool a bit then transfer the whole lot to a blender and blend until smooth – add more water at this stage if you think it needs it. Check seasoning and add salt and pepper to taste. This should make enough for 4-6 people. Cook the spaghetti according to the packet instructions, cut the broccoli into pieces and steam. When the spaghetti has cooked, drain and stir through the sauce. Pile into a pasta bowl along with the broccoli and sprinkle with parmesan cheese. Yum.